Those who have never experienced a large tropical city might feel overwhelmed by this metropolis of over 6 million inhabitants. High temperatures and humidity, enormous crowds in the streets, noise and traffic jams can be unnerving. But relax; Bangkok has so much more to offer. The city has a large number of palaces and temples, colourful busy markets and shopping malls, great hotels and a seemingly endless number of bars, clubs and restaurants, ranging from seedy to top notch and highly sophisticated. 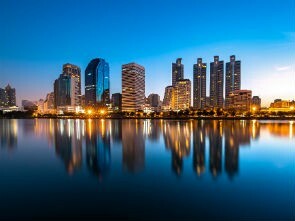 Bangkok surpasses other Asian cities for its vibrant and diverse life by far. Shop till you drop, there are a wide selection of clothes, silk, jewellery and art available. In Bangkok there are mainly four gay areas. Firstly, Patong is regarded as the night life address for heteros and gays, but gay life mainly happens in small lanes (called soi) off of Silom Road and Surawong Road. Gay bars, clubs and restaurants are around Silom Soi 2, 4 and 6. Go-go bars are located in a small Soi off Surawong Road. It is suggested to avoid touts at the entrance to the gay soi. The second most important area is Sukhumwit Road. In contrast to Patong this area has a large number of hotels and international restaurants. The third area is Sapan Kwai, which is north of the centre towards the old airport. And last but not least there is Ramkamhaeng north east of the centre. Not many tourists go here but if you are curious about how the locals enjoy themselves in their neighbourhood you will discover that here too there is a lot of fun to have.